This is an unofficial McKeesport Connecting Railroad railfan page. This page has no affiliation with the McKeesport Connecting Railroad or Transtar Inc. The McKeesport Connecting Railroad is owned by Transtar Inc., and it's official website is here. The MMcKeesport Connecting RailRoad (reporting marks MKC) is little switching railroad located in McKeesport. The MKC serves only one customer, the Camp-Hill pipe mill (formerly the National Tube plant). The MonCon interchanges with the CSX and with the Union Railroad near Riverton. I never got to do railfanning targeted at the McKeesport Connecting so I only have two photos with it. I do not have information about their operating schedules but it seems the CSX serves the interchange at Riverton in the morning, so an educated guess will have them active after that. The MKC only has a single locomotive on the property, an SW9 from co-Transtar Union Railroad. 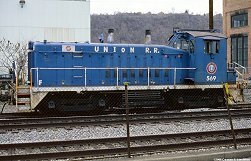 Union Railroad SWw9 number 569 sits at McKeesport behind the police station, a spring day in 2000. 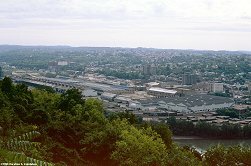 In late summer 1999 I went to Paule's Overlook at West Mifflin (I believe this restaurant is now closed), overlooking McKeesport. 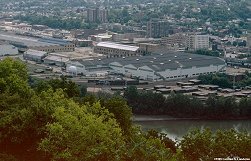 The MKC and the Camp-Hill pipe mill is seen by Monongahela River. A closer look at the same photo shows the switcher sitting on the mill trackage.